In cities across the country, public parks and playgrounds provide opportunities to increase routine physical activity among children during non-school hours. 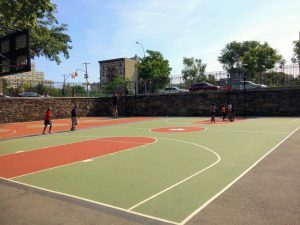 Because neighborhood parks are widely available and affordable, their potential to encourage children to be more active is particularly important in low-income communities of color. The NC State team for the Physical Activity Research Center (PARC) has been observing, surveying, and objectively quantifying use and physical activity across parks in New York City. NY, and Raleigh and Durham, NC. Across four months in 2017 our team observed more than 50,000 people using 20 different New York City parks. For consistency we used the System for Observing Play and Recreation in Communities, or SOPARC. Parks were observed during the school year (spring) and summer, weekdays and weekends, mornings, afternoons, and early evenings. We did not observe the entirety of each park, but instead pre-selected specific areas heavily used by children and youth (playground equipment, splash pads, basketball courts, etc.). Observations were brief scans of each of these areas once every 15 minutes for 2-3 hours per visit. We noted activity level (sedentary, moderate, or vigorous), gender, age group, race/ethnicity (White, African American, Asian American, Hispanic/Latino, and other/unsure. 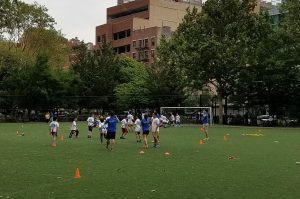 We worked with the New York City Department of Parks and Recreation and used US Census data to identify parks in lower income neighborhoods with high proportions of either Asian Americans or Latino/Hispanic populations and parks with at least one playground and sports court/fields. As PARC focuses on kids between 5 and 10 years of age, we want to share our observations on observing children across all these days; 79 unique days in fact. Over 16,500 children were observed during this study. Each momentary scan averaged over 1.5 children per area observed, or 56 children observed per hour. Playgrounds had the most children and there were more in the parks from 6-7pm than any other time (10am, 3pm, 3:30pm). More children were observed in parks during the school year than the summer, and more on weekend observations than weekdays. Areas of the park where organized activities were occurring or were in the shade were more popular than those not organized or in full sun. Most children were active during the observations (69%). Activity differed little across parks. Non-shaded areas were a little more active than shaded, perhaps accounting for activity on larger sporting courts and fields like soccer and basketball. Swing sets were also high in physical activity with children often vigorously pumping their legs to go higher and higher. 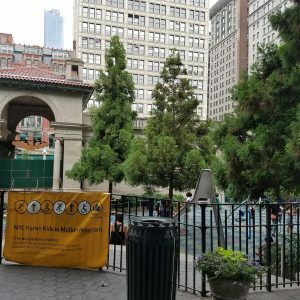 The parks and playgrounds we observed in New York City were well used. Across all visits, children were present over 60% of the momentary scans of playgrounds. Kids ran from playground area to swings to splash areas while parents, guardians, or older siblings sat nearby in the shade. During one observation, a parks staff member brought out bouncy balls, cones, and hula hoops, just setting these in the middle of the playground area. He did not provide instructions, but allowed the children to use the equipment as they wanted. A hula hoop competition ensued in one corner followed by the use of a hula hoop set on cones as a sort of basketball hoop with children running around and throwing the balls toward the hoops while others blocked their shots. Also anecdotally we saw families spending multiple hours in the parks during the summer, especially those parks featuring splash areas for the kids. 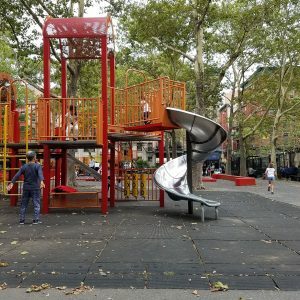 In the highly dense environments of New York the space of a park and playground and even the simplest of play equipment kept the parks well used across the four months of observations.